Wayne Imber used to teach Social Psychology and Developmental Psychology at various universities. In his 30 years as a professor, he has had the privilege and opportunity to teach in prestigious universities in different states, particularly Arizona, Chicago, and Massachusetts. Now that he is retired, he is focused on trying out English recipes and tweaking them to add his own touch. He is in the process of collating all of the English recipes he’s tried so far as he hopes to release an English cook book sometime in the future. In this post, he shares some of his favorite traditional English dishes. Oftentimes, people’s concept of English dishes leans towards American cuisine, so for the reader’s information, English dishes in this post refer to cuisine from the United Kingdom. What Wayne likes about English food is that the dishes are generally simple and straightforward—no fuss, in other words, yet they are packed with flavors that are a delight to the palate; think Cornish pastry, Yorkshire pudding, Sunday roast, and shepherd’s pie. 1. Bacon butty. Bacon butty is essentially a bacon sandwich, but this isn’t just any sandwich haphazardly made to satisfy your bacon craving. Putting the sandwich together is an art form that requires precision. 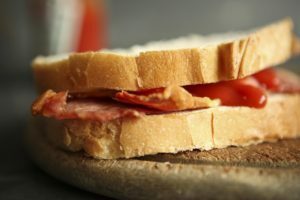 Although the locals have their own take on the sandwich, the consensus is to use white bread to make the perfect bacon butty. The bacon is fried to a crisp and then condiments are added to allow the flavor of bacon to stand out. Trivia: According to surveys, bacon tops the list of Britain’s favorite foods. 2. Fish and chips. What would British food be without fish and chips? Fish and chips are a staple among the English, and truth to tell, you can only find authentic fish and chips in Britain no matter how much other diners in other parts of the world claim to have “the most authentic fish and chips outside of England.” The dish involves coating fish fillet (usually cod) in a special batter before deep frying. A side of fried sliced potatoes is served with the fish. 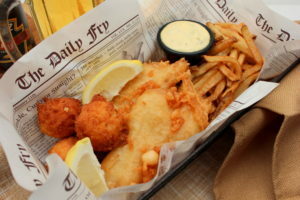 Traditional fish and chips used to be served wrapped in newspaper. 3. Bangers and mash. In England, bangers simply mean pork sausages and mash, well, mash is shortcut for mashed potatoes. To cook the sausages, you can either fry them or pop them in the oven. 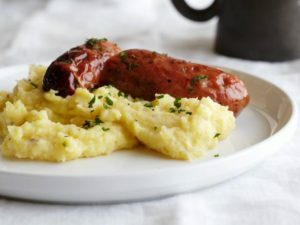 And for the mashed potatoes, the British usually add a generous portion of buttermilk to make it more flavorful—plus, the buttermilk taste perfectly complements the pork sausages’ earthy flavor. Do you have a favorite English dish? Do share it here with us! You may get in touch with Wayne Imber through this site.